Access Fort Wayne’s tape collection grows every day. It extends back in to the distant past. We have a front end of stuff that is pretty much unclassified. There are vague Genera assignments, but “Event” really doesn’t cut it for description. The backend is a little easier to parse in that time can give you a lens to look at events to decide if they work in context. Post 911 public events involving the Indiana Supreme Court seem to fit in to the “cultual/regional heritage” criteria. The DAP can guide us on what goes into the permanent collection while the CD can help us with the more recent items. The issue is the collection is serving 2 functions at the moment, it is a “Working” library for the facility where programs go in and are played for their timeliness and an “Archival” library that is useful as a recorded reflection of the community. At the staff meeting last night I brought up the fact that we are going to be presenting a workshop at the end of July on Community Media Archiving, specifically PEG Access collections. So we need to get our walk up to our talk. I was tasked with overseeing a workgroup that will hammer out the details of the care and feeding of the Access Fort Wayne Program Archive. The group includes me, the Program Director, the current archivist and some as yet unnamed I.T. person. It came to light that many of the files that have been “Born Digital” are in no way being archived. Standards for past formats will need to be written forward to include such formats. Digital asset management needs to be addressed. The storage, deletion and description of digital assets should be a priority as many of the external storage devices being used are near capacity. I will schedule the first meeting of this group for the end of next week. 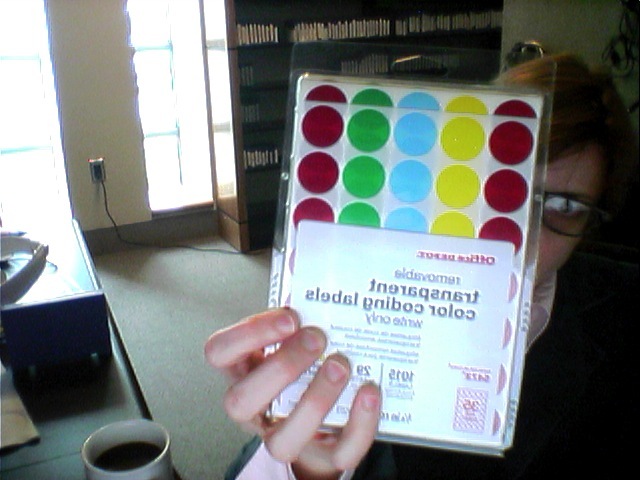 I asked for some dots to help with the archive building process. One of the basic tenets of archiving is preservation of original order* I’ve decided to mark tapes I think are worthwhile with these lil buggers so I can find them in the Access database and organize them in to series more easily. On a side note I had an interesting conversation with the Assistant Manager of the facility about the collection. First of all, there is an (outdated) collection development policy in place, taken from an early version of the library’s. Since we don’t have to reinvent the wheel here, one of the topics for the staff meeting today should be the revamping of that policy. Oh boy, I have something to talk about at the staff meeting! files of a feather stick together, records originating from one office or individual form a distinct body of material. restrain yourself, records are to be maintained in records/archives repositories in the same scheme of order and with the same designations they received in the course of the business of their office of origin and primary use. Only You….can prevent archive fires, the responsible manager’s obligation to ensure both the physical security and the intellectual integrity of the records as evidence. I’ve spent several hours down in the basement, looking through the stacks. The main collection starts in 1981 and runs up to the present. I’m up to 1993 or so and I’m starting to see series and sub series. I see Library Productions, Local Politics, History, Religious, Arts and Random Weirdness. The sub series include runs of programming that were also called series, so, Religious: /Power of God’s Word, 1998-2005, or Arts:Artlink Presents, 1986-2001. This is just the very first, very glancing appraisal. Luckily there is a good database of tape entries, the next step would be to evaluate the accuracy of the information in it. The tape library was moved twice in the last 6 years and has had several identification overhauls, one that is pretty serious where the entire tape numbering system was changed. I started an Excel spread sheet to collect the entries I’m interested in digitizing.